A guy bends down on one knee literally right behind my sister’s seat. The girl tries to pull him up. He whispers something to her. She nods her head yes. They then go to the window to pay their bill. A guy sitting right by the window asks if they really just got engaged, they say yes and he pays their bill as a congratulations. 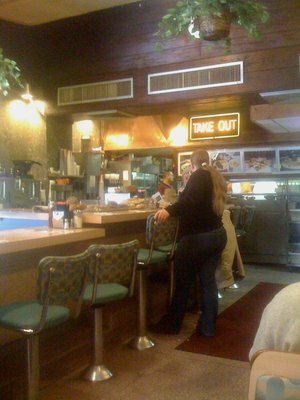 They depart the diner in newly engaged, greasy breakfast bliss. This is the spot where the engagement happened! Right behind the first chair on the left....a great place to get eggs, not a great place to "start your life together"
Ok….now this is either a brilliant plan by recession era Bonnie and Clyde grifters…or it is a really sad state of romance in today’s world. Not really sure which, but either way I am grateful that I am sad and single rather than engaged in a DINER!!! What are you thankful for? PS I am thankful for lots of other things….this just being one of them. Hope you all had a lovely Thanksgiving and Happy Black Friday!! This entry was posted in Sad Single Holiday, Sad Stories and tagged black friday, bonnie and clyde, diner, engaged, greasy spoon, Thanksgiving. Bookmark the permalink.